That third character, an abrasive entrepreneur named Frederick Montgomery Gwindell, said “no” to the newspaper scheme in the rare early recorded 1933 broadcast above, but in later stories became “a hard-charging newspaperman,” according to Wikipedia and other online sites about the series — which uniformly quote that phrase to describe the character. “Palm Springs Is to Have Another Newspaper. Word was received from Editor Frederick Montgomery Gwindell. yesterday, that he is en route to Palm Springs, with the printing plant of the Gwindell Printing Company in the rumble seat of his flivver, and that he will start a new newspaper here. Editor Gwindell recently left Weber City, New York, when he found that the printing business could not succeed in that town. Even radio series with no journalist characters gave powerful examples of the importance of the daily newspaper in American life. One of the most popular programs of the 1930s and ’40s, the brilliantly quirky and humorous “Vic and Sade,” is a case in point. As a series about everyday life, there were rare instances where the Gooks might find themselves in the newspaper, if only in a photo captioned Local Lodge Leader Takes First Dip or a news brief announcing that Sade had been named Grand Old Lady of the Drowsy Venus Chapter of Vic’s lodge, much to her chagrin. In the episode, Vick even attempts to hide the newspaper from her, but getting your name in the local newspaper is a powerful thing, and word of her celebrity gets back to Sade quickly. To my knowledge, no reporters or editors appeared in the episodes, but the newspaper itself was there — in the hands of the main characters. Stories frequently began in the living room or on the porch with the title characters and their son, Rush, reading newspaper stories to each other, commenting on the day’s events, or just passing the time. Series creator Paul Rhymer had great fun finding humor in the mundane, including the “news” reports of a small-town newspaper. Sade: It really says that? Sade: You think maybe you will write pieces for the newspaper about your trip? Vic takes umbrage, defends the idea, and recounts in detail one of his “side-splitting stories,” which isn’t. The humor is brilliant and subtle, and underneath is the reality that people really did take the newspaper seriously. “Vic and Sade” was an offbeat domestic comedy, far from the typical continuing-story “soap operas” and romantic serials; although it had no regular “journalist” characters, the daily newspaper was as much a part of its portrayal of daily life as the living room furniture. ED: Well sir, the evening meal has been over only a little while as our scene opens now and here in the living room of the small house halfway up on the next block we find Mr. & Mrs. Victor Gook. Our friends are seated on the davenport with sections of the newspaper and the master of the menage seems to have come upon an article of interest for he is reading aloud with briskness and enjoyment, listen. SADE: Oh ish Vic ….. Let me read my own trash here. VIC: What trash is that? SADE: Yes, and anyway I heard the kitchen door open. Is that you, Russell? RUSS: Hi Mom. (muffled) Somebody’s here. VIC: Mr. Curtis O’Slooner says, whose words I was quotin’ — formerly taught mathematics in college. RUSS: We’re going to have company. As was standard practice, Vic and Sade’s conversation was interrupted repeatedly by the arrival of their son, Russ, and Uncle Fletcher, each with his own attempt to break into the conversation. But Vic was steadfast about his newspaper. VIC: Curtis O’Slooner of course never says anything with nonsense. He’s just a poor half-wit. Poor old Curtis O’Slooner…. SADE: Oh ish, Vic. Where is Uncle Fletcher? RUSS: He’ll be right along. He paused out in the alley a minute to speak to Mr. Razerscum. SADE: Mr. Razerscum’s in Peoria. SADE: I don’t want to understand that craziness. Vic, read it to yourself. VIC: ‘Craziness’ she calls it. SADE: What do I care about ‘human ingenuity’ and trash. VIC: Trash. Trash she says. FLETCH: In the living room, are we, Sadie? SADE: You’re not going to hold that newspaper up in front of your face and read while we got company, I don’t suppose. VIC: I have a paragraph to finish. SADE: Put your newspaper down. VIC: I’ll put this newspaper down after I have finished this paragraph. Newspapers, whether for journalistic reporting or as entertainment, were part of American life — and radio dramatists showed them as such. Like “Vic and Sade,” another popular small-town comedy serial, “Lum and Abner” brought newspapers into the storyline now and then during its 23 years on the air (1931-1954). Lum Edwards, prominent citizen of Pine Ridge, made a hero out of himself Tuesday, when he defied death and waded through shot and shell to rescue a friend from a dangerous band of kidnappers. 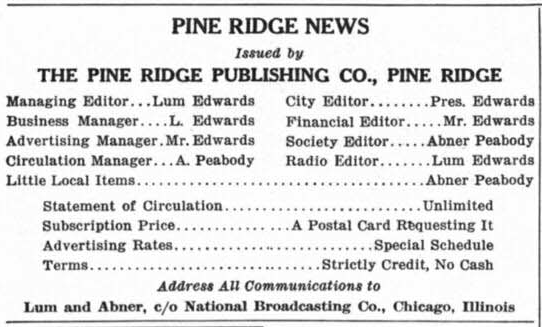 Back in the 1930s, the radio program published its own Pine Ridge News newspaper as a promotion and fan newsletter, listing Lum as most of the staff and Abner in a few positions. It featured profiles of the program’s stars Chester Lauck and Norris Goff, news of their public appearances, and photos of the actors in costume as the country shopkeepers. For more about Lum & Abner, a quick search will find dozens of online sources, such as the National Lum and Abner Society, which also offers a contemporary comic strip featuring the classic characters. Also, as mentioned above, “Easy Aces” brought a reporter character into the spotlight on several of its storylines. Here are links to JHeroes pages about series where journalists had major parts to play. Rogers of the Gazette, with Will Rogers Jr. as a homespun small-town editor with echoes of his father and a tone similar to the later Andy Griffith Show on television. Bright Star, billed as a romantic comedy adventure, with Irene Dunne and Fred MacMurray as editor/publisher and star reporter. Shorty Bell, with Mickey Rooney in a dramatic series with comedic elements. Easy Aces, which promoted its reporter character from secondary status to leading man for several weeks, while the stars were away on vacation. Newspaper film adaptations, including famous comedies like “Arsenic and Old Lace,” “Christmas in Connecticut,” “Front Page Woman,” “The Front Page,” “His Girl Friday,” “It Happened One Night,” “It Happened Tomorrow,” “Love Is News,” “Mr. Deeds Goes to Town,” “Nothing Sacred,” “The Philadelphia Story” and more.